Learn Spanish in Malaga at Instituto Andalusí. This Spanish language school is located in a peaceful residential area, close to the sea in a wonderful andalusian style house. In fact, it is so peaceful that lessons can be held in the school garden! The city centre is within easy reach by bus. The centre has 7 classrooms (high season 15 classrooms) that are decorated in a modern style to enhance a comfortable learning environment. The entire teaching staff is made up of native Spanish professors who have university degrees as well as extensive teaching experience. The blue water of the swimming pool twinkles in the garden and invites you to cool off while topping up your tan. The Andalusian patio, with shady trees and a barbeque, provides an ideal opportunity to become better acquainted with your fellow students, be it during the day or while practicing your Spanish at night. 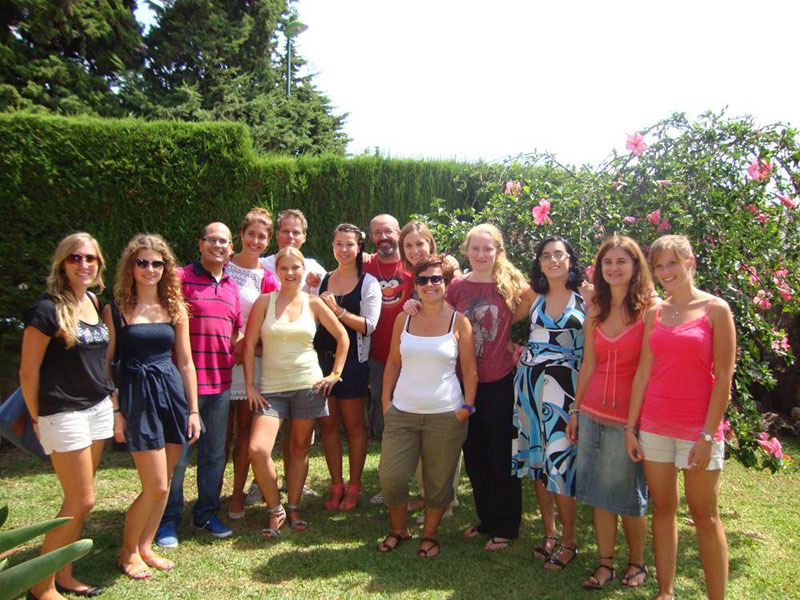 The intensive course is perfect for those participants who want to combine their Spanish study with holidays. You can choose between 20 or 30 lessons per week. The maximum number of students per class is 9, minimum stay 1 week. Double and single rooms in a studio are studios for 2 persons or 1 person respectively. A double studio can only be booked by two people travelling together. The price stated is for an airport transfer upon arrival. The price of an airport upon arrival and departure is € 85 p.p. In 2019 the school is closed: 01/01/2019 - 04/01/2019, 07/01/2019, 28/02/2019, 19/04/2019, 22/04/2019, 01/05/2019, 15/08/2019, 09/09/2019, 01/11/2019, 06/12/2019, 23/12/2019-31/12/2019.Missed lessons due to bank holidays will not be refunded or rescheduled. The commercial Spanish course is designed specifically for professionals and students who require an understanding of Spanish to communicate in the business world. The commercial Spanish course includes 20 lessons of general Spanish and 5 lessons of Spanish for business per week (max. 9 students per group). An intermediate or advanced level of Spanish is required. The commercial Spanish course requires a minimum level of advanced Spanish. The D.E.L.E course is specially designed for students who wish to take one of the D.E.L.E.- exams (Inicial, Básico and Superior). If you want to take the exam in Spain after your D.E.L.E course, please discuss with us what is the best date to start. The examinations are organized by the Instituto Cervantes. 25 lessons per week. This course requires an intermediate level of Spanish. Due to the exam date it will be necessary to book the accommodation until Sunday. Price for extra night on request. The golden age course is specially designed for older students who are interested in language and culture. The golden age course lasts two weeks, with 15 lessons per week of language tuition and 10 hours per week of activities. It also includes one excursion in the weekend. The golden age course groups consist of a maximum of 9 students. Example of the activities are: museum visits, cooking class, cinema, tapas tour, city tour, etc. The Golden Age course also includes an activity and excursion programme. A double room can only be booked by two people travelling together and particpating in the Golden Age course. This also applies for stay in a host family. This course is the most effective way of achieving goals in a limited amount of time. These classes are made to fit the needs of the individual. Also there is the option to share an apartment with other participants of the school. Students living in shared apartments will share a common area with a television, a bathroom, a fully equipped kitchen, a laundry machine, and generally a terrace or balcony. No meals. Get to know the Spanish way of life! We offer accommodation in a typical Spanish family with half board in a single or double room. If you are looking for a bit more privacy, you can choose to stay in a studio where you do not share the facilities. The studios have its own bathroom, kitchen and television. Most studios have a terrace. One- and two person studios are available.